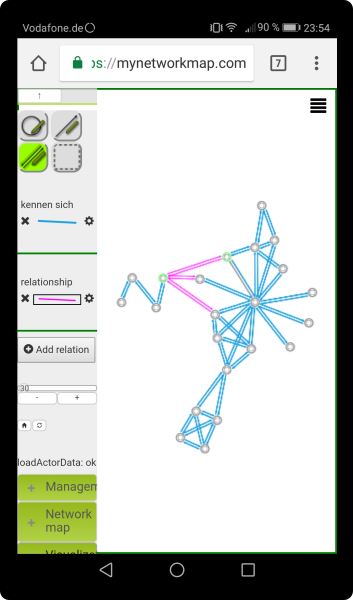 MyNetworkmap supports you in collecting social networks via online visualization and data input. Each additional user account will cost only 10€ (incl. 19% VAT) per month and can be cancelled monthly. In which situations can you use our tools? We would be happy to advise you on other possible applications. Write us a message or give us a call. We are looking forward to your inquiry! Kronenwett & Adolphs UG is a young and innovative company that has made it its mission to make social network analysis strategically applicable for companies and other organisations. The company offers solutions for the survey, analysis and visualization of social networks. The company was founded by Michael Kronenwett and Falk Adolphs, and since 2014 Michael Kronenwett has been the sole shareholder. Our servers are located in Germany and are operated 100% with green electricity. Authorized managing director: Michael Kronenwett, M. A. The protection of your personal data is very important to us. Insofar as we collect, process or use ("use") personal data within the scope of the services offered, this is of course done in compliance with the strict regulations of the relevant German and European data protection law. Within the limits of statutory provisions, we may evaluate user profiles under a pseudonym for purposes of advertising, market research and improving our services, but only to the extent that you have not made use of your statutory right to object to this use. This website uses the open source analysis tool Matomo (www.matomo.org) to generate statistical analysis on the use of the site. So we have the possibility to optimize the website for you and make it more visitor-friendly. Matomo stores the collected data (e.g. time, requested page, used browser, operating system) in a database. The information generated by Matomo is completely anonymous and cannot be used for identification of individuals. IP addresses are being redacted before they get into the database to meet the legal requirements. A combination of the stored data with other data sources or a passing on to third parties is not taking place. To gather metrics about your survey taking experience, To make our site easier to use, For security reasons, To provide you with personalized content, To improve our services, To advertise to you. Where you hold an account with any Kronenwett&Adolphs service, you are entitled to a copy of all personal data which we hold in relation to you. You are also entitled to request that we restrict how we use your data or object to some aspect of our treatment of your data. You can access a lot of your data in your own account when you log in. However, if you want to obtain a full copy of all your data or to request a restriction / limitation in how we use your data, please contact us here. By way of reminder, Kronenwett&Adolphs also enables you to export your own response data from our system in a variety of formats so that you can back it up, or use it with other applications. Where you have responded to a survey, form, questionnaire or application sent to you by a Creator, using a Kronenwett&Adolphs service, you will need to reach out directly to that individual or organization to discuss managing, deleting, accessing, restricting access to or otherwise withdrawing consent for use of, the information which you provided to them in your responses. We does not control your response data and, accordingly, is not in a position to directly handle these requests in relation to that data. If you are having difficulties finding this Creator you can contact us and we will try our best to help you.